If you’re tying the knot in one of Thailand’s private island villas, it’s almost impossible to ignore the attractions of holding your wedding outside with a backdrop of tropical splendour. For all of the brides and grooms that flock to Thailand to say their vows, one of the main attractions is the possibility of a gorgeous outdoor wedding on the beach. Couples getting married in one of the Kingdom’s luxurious holiday villas also have the chance to host the ceremony within the property’s lush landscaped gardens or on the wide sun terrace next to the pool. However, hosting an outdoor wedding comes with its own set of considerations, especially if you want to guarantee your guests enjoy the experience as much as you. Below are some tips on how to get an outdoor wedding right in the tropics. It’s unlikely that guests flying halfway around the world for your wedding in Thailand are going to be accustomed to the strong heat of the Southeast Asian sun. That’s why it’s important to give them some form of shading on your big day – even if you are hosting your wedding on a sun-flooded beach. Parasols (translating to “for the sun” in Spanish) are a cute and visually striking way of providing the shade your guests will need. 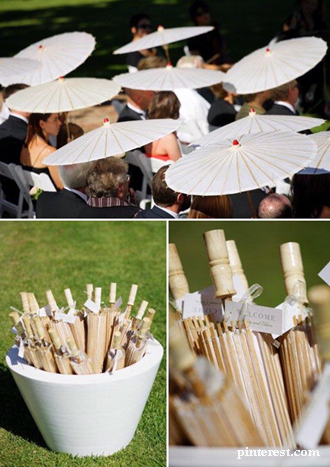 Have a basket of parasols placed near the villa’s doorway so guests can grab them as they head outside for the ceremony. You could even coordinate your parasols with your wedding décor and colour themes if you want to create real wow factor. If you’re hosting your wedding in the villa’s garden, perhaps in a position that’s somewhat tucked away from the refreshing sea breeze coming off the ocean, then think about providing fans for your guests. For an extra special wedding flourish, you can even have the fans decorated with wedding motifs to match the theme you have chosen for your special day. 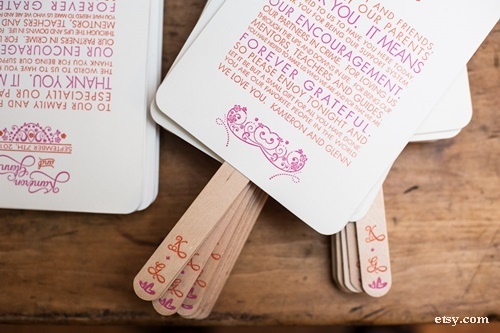 Some brides and grooms may even choose to kill two birds with one stone by printing the wedding programme on the back of hand fans for guests’ to read. 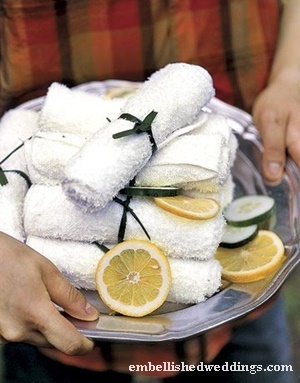 If it’s a real scorcher of a day, then ask your villa staff to prepare chilled herbal towelettes to offer your guests after the wedding ceremony. As well as providing a refreshing boost they will also smell great and add an extra flourish of luxury to your wedding day. If you like, you could also prepare miniature bottles of face cooling mist for guests to spray when they’re feeling a little too warm. A chilled concoction of cucumber, mint, lemon and water will work wonders to revive you when you’re starting to feel over-heated. If you’re getting married in tropical climes, ensuring that your guests stay hydrated throughout the day is absolutely crucial. Luckily, if you’re hosting the event in one of Thailand’s opulent private villas, the staff will always be around to provide guests with chilled drinks to keep them feeling quenched and refreshed. If you’re worried about bugs or any sand particles making their way into your chilled beverages, then prepare themed drink wrappers like to go over the top of the glasses. 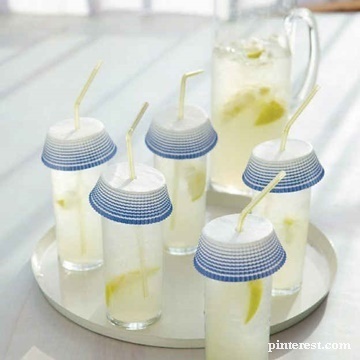 A straw can be placed in the middle so guests can sip happily away without any unwanted elements blowing into their delicious mocktails. Last but by no means least, it’s worth setting up an outdoor relief station if you’re hosting a wedding on the beach or in your villa’s private tropical gardens. This can be a place where guests can go to put on extra sunscreen, as it’s unlikely their sun block will fit into wedding clutch bags, and perhaps even insect repellent once the sun has set. 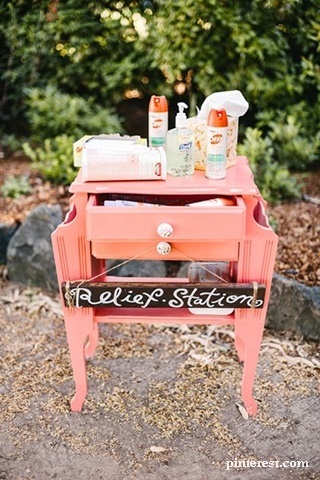 In order to keep your relief station nicely styled and in keeping with the theme of your wedding, put sun cream into colourful dispensers. Such well thought-out details will transform your wedding from a great day to something that’s truly memorable.